It is said that a leader inspires the whole institution and the way he breathes and thinks, the institution thinks and breathes. Hence, if the leader changes, everything about the institution also does. What better example for this can be than the Miss World pageant which has changed a lot after change in the leader? Let us have a look how the Miss World pageant has changed over the past two decades. Years 1994-1996: In these years, the format of the pageant was pretty similar to the format followed by the Miss Universe pageant in year 2002. Ten semi-finalists were chosen and they competed in evening gowns and swimsuits. Five finalists were chosen who answered questions from the judges. The winner was chosen based on the final answers and overall impressions. Year 1997 DELETION OF THE SWIMSUIT ROUND: In this year, the major change was chopping off of the swimsuit round. Since this year, there has been no swimsuit competition in the finale events of the pageant and this is a feat in itself because in every other international pageant, the swimsuit round is always there and in fact it is most often the highlight of the final show. Julia Morley has said it on record that swimsuits are meant for beaches and not for stage. In the years 1997 & 1998, five finalists were not identified. Ten finalists were chosen and then directly winner was declared. But from 1999 to 2001, there was a positive change. Ten semi-finalists were chosen and interviewed. Then again five finalists were chosen and interviewed before selection of the winner. Year 2001 BLACK WINNER: The pageant which boosts of being the grandest one in the world, never had a black winner prior to 2001. This changed this year and again after that there has been no black winner. Anyone who saw Miss World 2001 can see that Agbani from Nigeria was not the best in the final round but still favored. It is fine because she is a wonderful woman and Miss World finally had a black winner. Since then many black girls have been among the toppers but none of them have won. Year 2002 TOP 20 & REDUCTION IN TRANSPARENCY/LOGIC: Eric Morley passed away in the year 2000 and after him, the first major change that we saw in Miss World pageant was in the year 2002. It was obviously a decision of Julia Morley and frankly we feel it was a step-back for this wonderful and celebrated pageant. To suffice the national directors and TRPs, twenty semi-finalists were chosen. Now wait, we actually appreciate this. More girls get recognized. But we just feel there could be some logic in cutting down 20 to 10. That year, we saw clips of the twenty girls and then ten were chosen. No one knows how this cut was made. Of course there must be a process behind the same but then why were viewers left out of it? If it had to be done privately, why not finish it before finals? It seems a bit concealing to carry out the eliminations like this. Even after the selection of 10, the finalists gave answers to questions from the host and winner was chosen. Again, we would like to know more about the parameters for the selection process. This is exactly where Miss Universe shone over Miss World and still does. YEAR 2003 FAST TRACK EVENTS: It was since this year that fast-track events begun. The trend still continues. Somehow we actually like this concept. It makes the pageant different from the other pageants. Plus there are more activities. When it comes to Miss World, people begin to follow the pageant the day it begins and not just on finale. This is because of the fast-track events. Beach Beauty is fun to follow & Top Model is a very good concept. It is appreciated that competencies in sports and talent are also celebrated. Beauty with a Purpose is one of the best things in Miss World pageant. Recently Multimedia award is being given and again it benefits the pageant (promotion) and allows the girls to connect to their fans. In 2004, the results were totally determined by public vote. Picture shows Miss Philippines Maria Karla Bautista who finished fifth in the finale. Year 2004 PUBLIC VOTE & DEATH OF Q/A ROUND: This was change in Miss World which made it unique and different from other international pageants. This should not be taken as compliment because we actually liked the question-answer round. 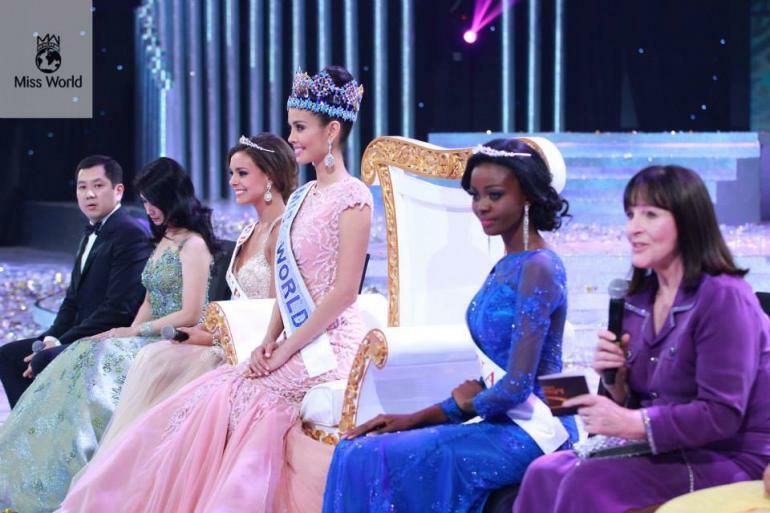 Since this year, the girls are mostly asked general questions about the goodness of the pageant and the host country. It seems as if the winners are decided since beginning of the show itself and all this is just a formality. As a pageant fan, I am interested in knowing why a particular girl won the pageant and a particular girl didn’t. I want to be a part of the selection process. I am not interested in being a spectacle – I want to be a part of the process! I want to be engaged and involved in the process of selection of the winner. I want to see some drama which results from competition and eliminations. Girls should get a chance to demonstrate their confidence and spirits. Of course, there was extensive public voting in years 2004-2006 for selection process, but we all know it is overall a bogus concept to choose winner in any event, let alone pageants. Public vote played a major role in 2004 and for few coming years. It exists even now but its importance is reduced compared to those years. YEARS 2005-2006 REGION-WISE SELECTION PROCESS: Miss World always had the concept of continental queens but for two years, the pageant explored it in a different way. Contestants were divided into groups based on geography and fixed number of semi-finalists was chosen from each. We actually like this concept because it added some logic to the haphazard way in which selections are made in the finals in previous years. Rather than totally eliminating, this concept could have been developed into something better. YEAR 2009 DANCES OF THE WORLD: This is another change that we highly appreciate in the pageant. It is fun to watch the girls from different countries show a bit of their dancing skills to music from their own countries. It is a unique variation to the national costume show but just like the national costume show, it enables the girls to show a bit of their countries’ cultures. Plus national costume round becomes a fancy dress contest in most pageants since girls do not really brief the stories behind the costumes. CURRENT YEARS FORMAT: The girls participate in different fast-track events and interviews and based on their placements in events and scores in interviews, top 20 is chosen which is randomly cut down to top 10 and then 5. Beauty with purpose and Dances of the world still shine as the best aspects of the pageant. Top 5 girls are asked general questions about why they want to win and winner is chosen God knows on what basis. It seems it’s all predecided and the show is just a formality. ROAD-AHEAD & EXPECTATIONS: Miss World is very different from all pageants and still enjoys the reputation of arguably being the biggest and best pageant of the world. With Beauty with purpose as the essence, the pageant earns a lot of respect of people. With different fast-track events, it appreciates different aspects of women. And yet you will find many who call it a tea-party. You will find many who call it boring. You will find many who find it sense-less. It is not sense-less. Winners are sensibly chosen, after observations from the very beginning of pageant. Of course some politics might be involved, but mostly good girls get noticed and their beauties are acknowledged. We just feel there could be many positive changes. We would like to see the girls compete during the finals. If twenty finalists are chosen, we would like to see them present themselves on the stage in evening gowns and even swimsuits. We would like them being interviewed with sensible questions. We want to know the brightest girls. We want to know the most confident girls. We want to know the most beautiful girls. We want to be a part of the process of selection of winners. We want some transparency in the pageant. We want to see some logic and sense in the process of selection of winners. We want to believe in the rightness of the process of selection of winners. Of course a lot is right with the pageant. We like the fast-track events. We like the dances of the world. We like beauty with purpose. We like the stage. We like the contestants – the best set every year as compared to other pageants. But it would be WONDERFUL to see some traditional competition too. Even the addition of a Q/A round where girls answer questions from the judges and winner being chosen based on the final answer will do good. Just imagine how much fun would it be if the top 5 (no peoples’ “not really all that good” choice making it top 6) this year had answered questions from different topics and the final results were based on their answers. Even this little change would have made it a lot more credible pageant. I am pretty sure a lot of you reading agree to me. To conclude, Miss World is one pageant which keeps on changing. It is modern. It is progressive. It is becoming grander. It is bold. We just feel that a little visible competition and transparency will make it more believable and entertaining. It is a good pageant and it can become better! Miss Nepal Ishani Srestha won Beauty with a purpose award in 2013. She bagged this title with her ‘Project Smile’. Being a dentist helped her a lot because her initiative was simple – to bring a smile on people’s faces! She organised a free dental camp in one of the most rural places of Nepal, a district called Jumla popular for organic farming and located in the far western region of the country.